Oh Haagen-Dazs, my immense apologies. How is it that it's been a year since we've seen each other? 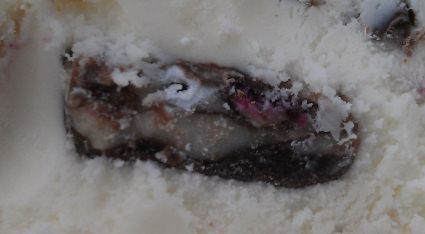 The White Chocolate Raspberry Truffle Review was just shy of a year ago, and ironically enough, the review below is based on a similar white chocolate ice cream base. So I was trying to get my office cleaned up yesterday, and as a reward, I knew that lunch time meant ice cream time. Since DQ is closed, I headed over to Roche Bros to take a stroll down the ice cream aisle. I didn't expect to find anything different, but then I saw it. Haagen-Dazs Limited Edition Peppermint Bark ice cream : Decadent white chocolate ice cream blended with crumbled peppermint bark and peppermint twist candy pieces. Sure, I had every intention of getting something lighter today, but it's less than two weeks until Christmas and I haven't had a single seasonal flavor up yet. I dig in and instantly begin kicking myself for waiting a year between servings of H-D. They make such a wonderful ice cream that is clean, rich, and creamy. Top notch. I take a few more bites and my mouth starts to get a bit tingly. There are a ton of chunks up top and my senses are overflowing with mint. Wow! Now that's some powerful stuff! I change my aim and find a small patch of just white chocolate ice cream. Mmmmm, man this base is good. It's wonderfully creamy and the white chocolate flavor is spot on. I can't help but wonder why H-D doesn't sell the white chocolate all by itself. It's really good and would hit the spot when I'm in the mood for something peaceful. Now that the base ice cream has built up a nice coating on my taste buds, I can settle back into my treat now. I start back into the abundant chunks. Basically they are just crushed candy canes covered in chocolate. What surprises me is that they are crunchy, but not crazy crunchy.. actually, thud is more appropriate than crunch. There's no fear of breaking a tooth here. They are neat little chunks with the peppermint insides totally overpowering their chocolaty coating. 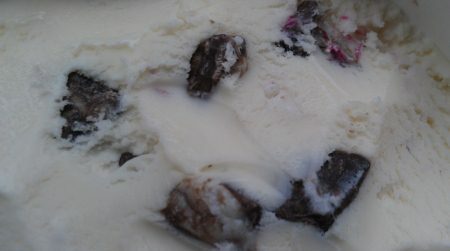 Another nice touch is the peppermint pieces scattered throughout the ice cream. They add these neat little red specs everywhere. Often they aren't more than the size of a crumb, but other times you start hitting a few of the larger pieces (like a 1mm thick candy cane cross section). However you find them, they do seem to add flavor so that's what matters. All in all, an excellent seasonal ice cream. The base is excellent and the mixins are unique, but you better be real sure you like mint before digging in. For example, if you like shoving multiple York peppermint patties in your mouth at one time, you should definitely enjoy this one. As for me, I'll be enjoying this one slow and steady. It's just so flavorful and rich, there's no real reason to have more than one serving at a time. On Second Scoop: Well, I was going to bring this one home to my wife since I'm almost positive she'd like it.... but, well, I just blew through my second serving and there's not a whole lot left now (I'll just pick her up her own container). All my second scoop early bites were just ice cream and candy cane bits and this led me to a thought. Peppermint Bark needs a limited edition brother named Candy Cane. It'll be the same thing, just without those neat chocolate covered bits. We all know how candy canes crunch, especially when it's thin, now just picture that in an ice cream. If that floats your boat, I suggest you go pick up a pint (or three). My only real complaint is that at some point during the treat it always overpowers me. I'm going to be tasting mint all afternoon (...and evening) ---- note: my wife did eventually have some, and she agrees, it's really well done. I love peppermint on its own, but I just can't get on board with peppermint ice cream. It scares me way too much. do you eat any mint ice creams? I'm not a huge mint fan either, but this one is just plain fun. 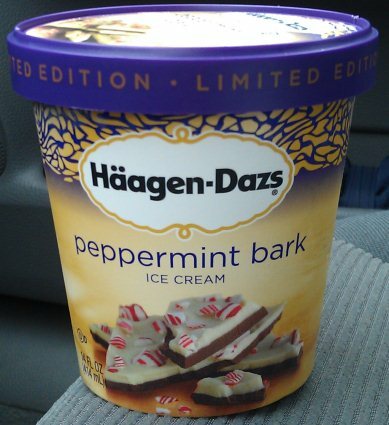 Peppermint Bark has always been a favorite treat of mine, so it's neat to see it played out as an ice cream flavor. You don't, by any chance, happen to know if there are any kinds of YPP flavored ice creams out there, do you? That sounds like a good combination to me! When you say serving, are you going by the labels size? 3.5 always struck me as odd. @Rodzilla: in this case, i am talking about the traditional "serving" size of a 1/2 cup (4 fl oz). If you want to get real technical, I had a serving on my first scoop, probably 1.5 on the second scoop, and there's only 1 serving left. This is one of my favorite flavors, sadly it's become hard to find around here. I'm going to have to go search out a few pints next week, after I clear out some room in my freezer. They always run out of this flavor way too soon! I like it in my espresso! 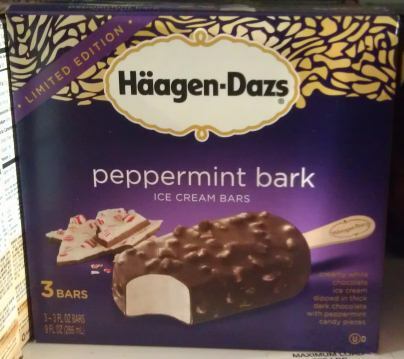 Not sure if Haagen-Dazs has carried this in previous years, but I recently saw Peppermint Bark in BAR form at my local groceries. But I don't see it listed on HG's website. I agree, there should be a plain white chocolate flavor because it is brilliant!! The peppermint bark bars are definitely new for 2012. Nick spied them the other day but I haven't seen them for myself yet. somebody needs to get on this, so many wonderful possibilities! 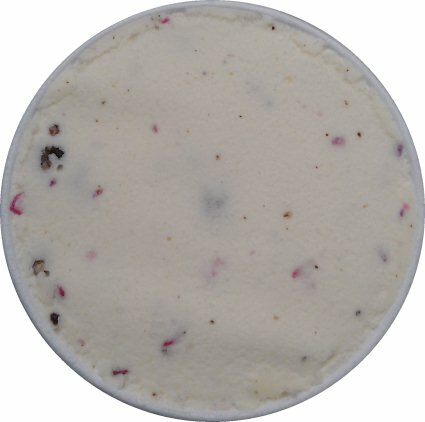 I would like to recommend the splendid Talenti's holiday edition, Peppermint Bark. I ran into a problem with my last batch of Peppermint Bark. It was extremely soft coming out of the grocery freezer. I thought it had sat too long waiting to be stocked. After 36 hours in my freezer, it refused to firm up, even though everything else in the freezer was frozen solid. The consistency was somewhere between whipped cream and pudding. I went back to the store to check their stock and the remaining cartons were the same. I emailed HD and haven't heard back. I've checked several stores now and can't find the Peppermint Bark anywhere. I don't know if it's end-of-season or if there was really something wrong with it. There aren't that many substances that won't freeze at 0 degrees F. Most of them you do not want to ingest. While checking another store today, I found the Peppermint Bark on a stick. It's ok. I've never cared for ice cream on a stick. I don't like having my last mouthful taste like a wooden stick, and they're messy to eat. The PB on a stick was not nearly as potent and intoxicating as the original carton. Has anyone else found this problem? I live in Illinois, north of Chicago. that's a weird one. Maybe the grocer's freezer had been recently stocked (and therefore soft), but not sure why it wouldn't refreeze for you. Just wait for H-D to get back to you, I'd be surprised if they didn't investigate further. I have been looking everywhere for Haagen Dazs Peppermint Bark since October. I live in 30274 Zip Code. Please Help me! I absolutely love Peppermint Bark anything. thanx, it's my all-time fave of ice cream !! !